While it depends on their age, species, and habitat (aquatic, semi-aquatic, or terrestrial), salamanders will eat anything that moves that is small enough to fit inside their mouths. Pets: When kept as pets, terrestrial salamanders primarily eat insects and worms, and aquatic salamanders primarily eat brine shrimp. Before we talk in depth about what salamanders eat, let’s talk about what a salamander is. Often confused with lizards, salamanders are not related to them at all. They are amphibians (like frogs and toads) which means they are cold-blooded vertebrates (they have backbones) that do not have scales. They are in the class Amphibia. Lizards, on the other hand, are reptiles (like alligators and snakes) which means they are cold-blooded vertebrates that do have scales. They are in the class Reptilia. Even though salamanders and lizards are unrelated, salamanders are lizard-like in appearance. They have slender bodies, blunt snouts, and tails. Salamanders are well known for their bright coloration and their ability to regenerate lost limbs in only a matter of days. If only humans could do that too! An easy way to distinguish salamanders from lizards is that salamanders do not have clawed toes and they have smooth, moist skin (whereas lizards have clawed toes and dry skin with scales). Another difference is that lizards have external ear openings and salamanders do not. Also, both species produce eggs, but salamanders typically lay their eggs in water, and reptiles typically lay their eggs on land. Salamanders can be either aquatic (living primarily in water), semi-aquatic (living half on land and half in water), or terrestrial (living primarily on land). The term semi-aquatic also refers to salamanders that live primarily on land but return annually to live in water during their breeding season (as opposed to living on land and depositing their eggs in a water source). Habitat plays a huge role in the type of food that salamanders eat because different habitats have different food availability. What’s the Difference Between a Salamander and a Newt? 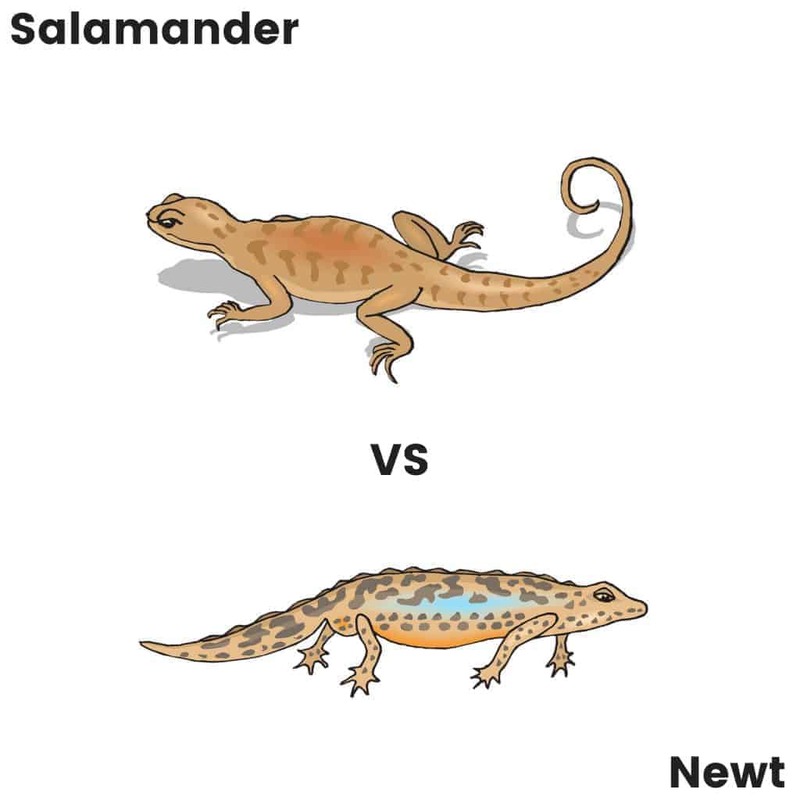 Although the terms salamander and newt are often used interchangeably, there is a difference between the two. Newts are a type of salamander that is from the subfamily Pleurodelinae. This means that all newts are salamanders, but not all salamanders are newts. Newts are aquatic or semi-aquatic. They typically have webbed feet and flatter, paddle-shaped tails, while salamanders typically have non-webbed feet and longer, rounder tails. Their skin is also not as smooth as other salamanders’ skin. Since newts are primarily aquatic, this means that they have different food sources available to them than terrestrial salamanders do. For this article, when referring to salamanders, we mean salamanders in general and not newts specifically. So, now let’s discuss what salamanders can eat. Salamanders’ diets depend on their age, species, and habitat (but there are some commonalities in their diets). Salamanders are completely carnivorous (meat eating) except for one species (Sirenidae) that eats plants and algae along with meat. Salamanders are predators and prefer their food to be alive (they are attracted to movement). Therefore, freeze-dried and frozen food is not recommended for salamanders (although they may eat it if there is no other option or if it appears to be moving). Salamanders will eat anything that moves that they can fit inside their mouths, and they tend to eat small invertebrates (animals that have no backbone) because they are easier to swallow. Salamanders also practice cannibalism (eating their own species as food), so care must be taken when housing salamanders together. Also, because they are so undiscerning with their food, this means they will eat smaller aquarium fish if housed with them. Salamanders do need variety in their food, but their primary food sources (when kept as pets) are insects and worms (for terrestrial salamanders) and brine shrimp (for aquatic salamanders). Semi-aquatic salamanders tend to eat based off where they spend most of their time (or eat indiscriminately). Overall, salamanders are certainly not picky eaters! All salamanders are predators, but their methods of catching prey can differ. Terrestrial salamanders typically catch their prey with their long, sticky tongues (like frogs do), and they can shoot their tongues out at incredible speeds. Most are relatively slow and depend upon the element of surprise to catch their food. Aquatic salamanders typically catch their prey in their wide-open mouths by either out-swimming their prey or ambushing them (although there are some aquatic salamanders that do have tongues that shoot out). Most are relatively agile and depend upon this ability to either out-swim or out-maneuver their food. Semi-aquatic salamanders are not so cut and dry, and it depends on the species whether they can shoot their tongues out or not (but most can). What Do Baby Salamanders (Nymphs) Eat? Baby salamanders are called nymphs, and they have a different diet than adult salamanders do. Most salamander species lay their eggs in water (there is one species that gives live birth), and even terrestrial salamanders will migrate to an area with some form of water to lay their eggs. 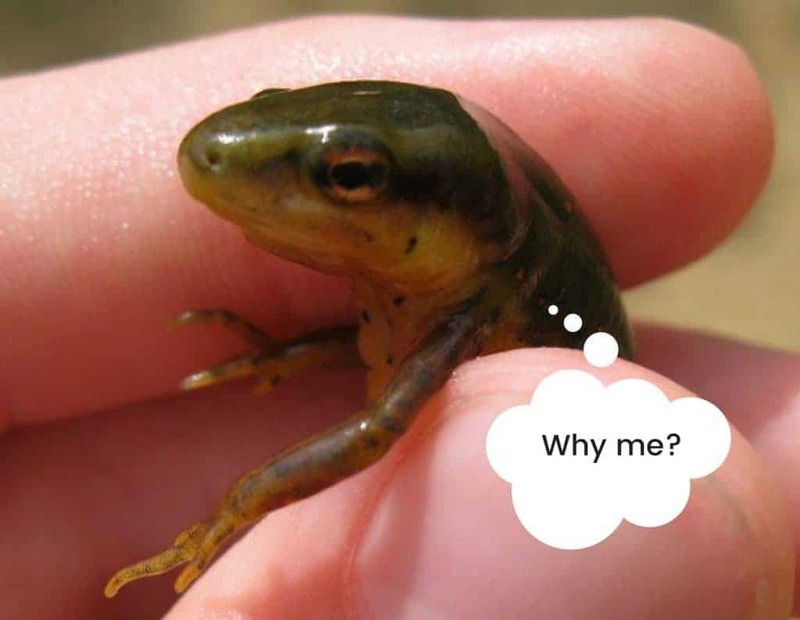 Since baby salamanders are hatched in water, this affects what they can eat. When nymphs are first born, they do not have legs, and they look similar to frog tadpoles (the larval stage of frogs) in appearance. They eventually go through metamorphosis (transforming into an adult through different stages) like most amphibians do. Nymphs are carnivorous from birth and are born with teeth. After they hatch, they eat their own eggshell (which they live off for the first week of their lives). Then they move on to eating small prey such as small microorganisms, brine shrimp, plankton, or small insects (while still staying in their aquatic habitat). As the nymphs mature into their juvenile stage (and eventually adulthood), they progressively eat bigger and bigger prey. This is also when they start to migrate to their normal habitat (either staying aquatic, becoming semi-aquatic, or becoming terrestrial), and these habitats have different food availabilities. After a salamander is two months old, it is considered an adult. 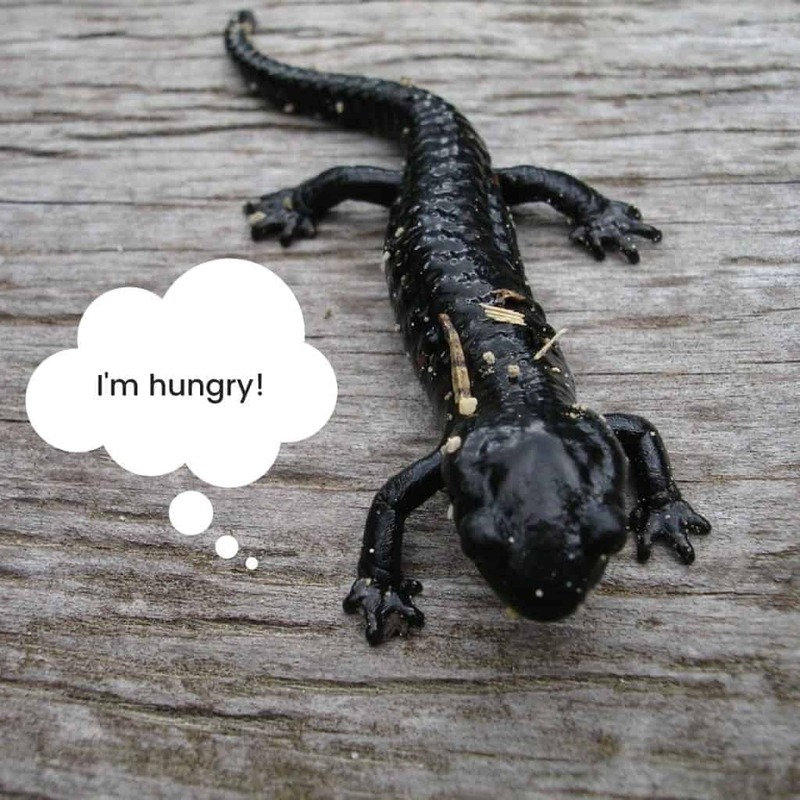 What Do Adult Salamanders Eat? As mentioned previously, adult salamanders will eat anything small enough that fits inside their mouths (typically small invertebrates). The main difference between nymphs and adult salamanders is that adult salamanders eat larger prey and they are not restricted to a water habitat (unless they are aquatic or semi-aquatic). However, their diet in the wild is much different than their diet as pets. In the wild, they will eat almost anything they can catch, but in captivity, their options are more limited. When you walk into a pet store, there are not rows and rows of live invertebrates for you to choose from (at least not normally). When kept as pets, adult terrestrial salamanders primarily eat insects and worms, and adult aquatic salamanders primarily eat brine shrimp. It’s important that salamanders get a variety of food to ensure they are meeting all their nutritional needs (there are a multitude of different insect and worm varieties to choose from). Also, remember to cut up any worms that may be too big for them to eat on their own. No one wants to choke on a worm, not even a salamander! Also, if you are tempted to go out and catch your salamander some insects on your own, be warned that many wild-caught insects can be dangerous to salamanders. They might have been sprayed with pesticides, carry diseases, or be potentially toxic (like certain species of butterflies, ants, beetles, etc.). Even though salamanders are carnivorous, they are not meant to eat human meat/food (like red meat, poultry, beef, fish, or cooked meats) and cannot digest these foods. Think about if your salamander could have captured the food you are offering them themselves. If not, then it’s probably best not to feed it to them. If you are worried that your salamander is not getting enough nutrients (or if they are sick), then there are also calcium and vitamin powders (as well as multivitamin supplements) available that you can purchase. These are typically sprinkled on the live food right before the salamander eats. One way to ensure that your salamander is getting enough nutrients is to make sure that they are eating food that is labeled as “gut-loaded.” This means that the food source (insects, worms, etc.) has recently been fed (which in turn means that your salamander is receiving a lot of nutrients). Also, different species have different preferences and needs, so when in doubt, it’s best to ask a professional (such as a veterinarian who specializes in amphibians or the place you purchased your salamander from). How Often Should I Feed My Salamander? Adult salamanders should be fed 1-3 times weekly depending on their size (but should be fed more frequently if they are re-growing any body parts). Nymphs and juvenile salamanders should be fed more often (typically daily). If you have just received your salamander, they may be underfed (especially if they are coming from a chain pet store) and can also be fed daily until they are at optimal weight. Salamanders who are stressed may need to be fed by hand (using tweezers or toothpicks) until they have adjusted. Never feed salamanders by holding the food in your bare hands! Not only do salamanders have teeth and can bite you either accidentally or if stressed (also all salamander species secrete toxins to varying degrees), but the oils (and other substances) found on human skin is damaging to them. Salamanders have very permeable (penetrable) skin that is meant to readily absorb water (but their skin can also absorb any substances that you have on your skin). For this reason, it’s also important to remember not to handle your salamander too much and to always treat them with care. Also, many terrestrial salamanders hibernate in winter, but those that do not (as well as aquatic salamanders) tend to eat less in winter than in summer. You should aim to adjust your salamander’s diet accordingly. Most salamanders are nocturnal, so it’s best to feed them at night (or at least in the evening) when they are more active (rather than in the middle of the day). You should also try to keep your salamander on a food schedule (hunger is not cool!). Also, try to make sure you are not overfeeding your salamander. About 10-20 minutes after you have fed your salamander they should be full, and you can then assess what is left over to determine how much your salamander prefers to eat in one sitting. Always remove leftover food (in terrestrial tanks the live food may bite or injure your salamander, and in aquatic tanks, they can contaminate the water). Salamanders will eat anything that moves that is small enough to fit inside their mouth (typically small invertebrates that have no backbone). When kept as pets, terrestrial salamanders typically eat insects and worms, and aquatic salamanders typically eat brine shrimp. Make sure your salamander is getting a variety of live food (such as different insect or worm types). Make sure to cut up your salamander’s food (especially worms) if it’s too big. Keep your salamander on a feeding schedule (and adjust for temperature variations). Try not to overfeed your salamander and remember to remove excess food. Try not to hold them too much.